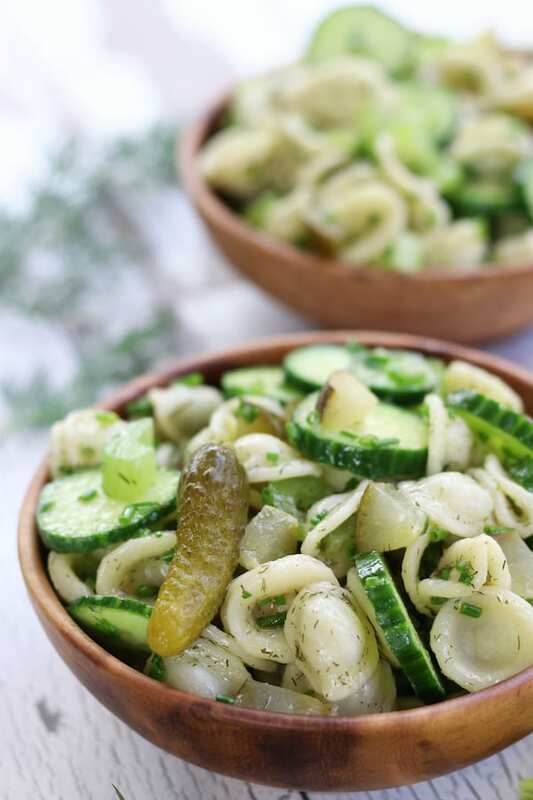 Bright and crisp, this Dill Pickle Pasta Salad is mouthwateringly addictive. With absolutely no dairy, loads of chives and dill pickles makes it perfect for your summer cookout. Have you ever been to a summer potluck or BBQ where there are a bunch of delicious mayonnaise based salads and they leave them out all day? By the time you get to sit down to eat you wonder if you are giving yourself self induced food poisoning. 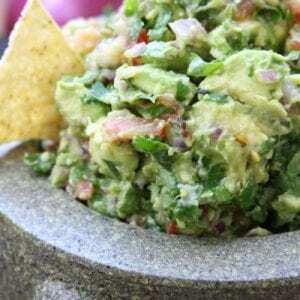 Or worse yet, you hold the summer party and you spend most of your time putting salads into the refrigerator and then back out again every time someone wants to eat for fear of causing Montezuma’s Revenge from Aunt Eloise’s potato salad. 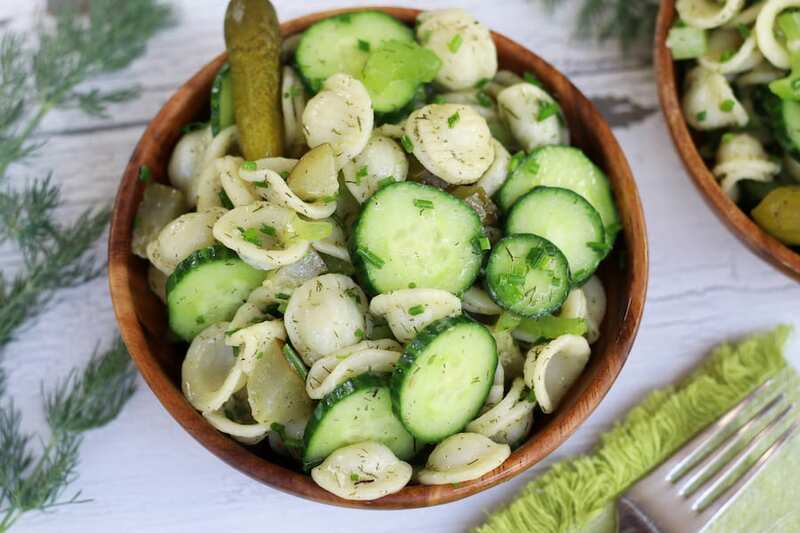 The simple solution, make a phenomenal tasing pasta salad without mayonnaise like this Dill Pickle Pasta Salad. Another recipe that I absolutely adore for this very same reason is Springtime Pasta Salad. Both are light, refreshing and I have seen many people go back for seconds and thirds. Also, this bowl will help solve the worry of flies and other vermin landing on your pasta while you are out tossing the frisbee or playing in the pool with your kiddos. So here’s the secret… you ready??? (I am so excited I can hardly contain myself!) Make a vinaigrette with olive oil, pickle juice, garlic and dijon mustard. Load in lots of dill, chives, pickles and cucumbers to al dente cooked pasta, toss and you have pickle lovers dream come true. It really is that easy, but here are just a few things to keep in mind. Cook the pasta in a large pot of boiling heavily salted water. 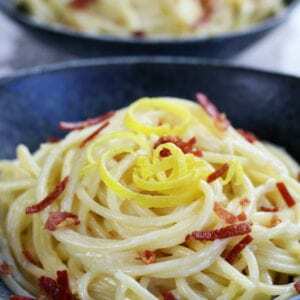 This one step evokes quit a bit of emotion but check out my Simple Angel Hair Pasta recipe where I really break all the how to’s down. Make the vinaigrette while the pasta cooks . Once the pasta is al dente add to the vinaigrette and toss. Let it cool to room temperature before adding the chives, cucumbers, celery and pickles. This will help keep these ingredients super fresh and crisp. Use your favorite pasta shape. I really like orecchiette shaped pasta for this recipe but it is super important that it be tailored to you and your family preferences. That just really ups the fun factor. I am a bit of a tree hugger (yes, I am joking…kind of) and food additives like calcium chloride do concern me. You will find that most dill pickles on the market, even the organic brands, have calcium chloride as an additive. Here is the bottomline for me and my family, if we are eating pickles occasionally I am ok using jarred organic pickles with this as an additive. On the other hand, if anyone in my family or myself develops a dill pickle fascination, there will definitely be a fresh batch of Homemade Refrigerator Pickles always ready to go. 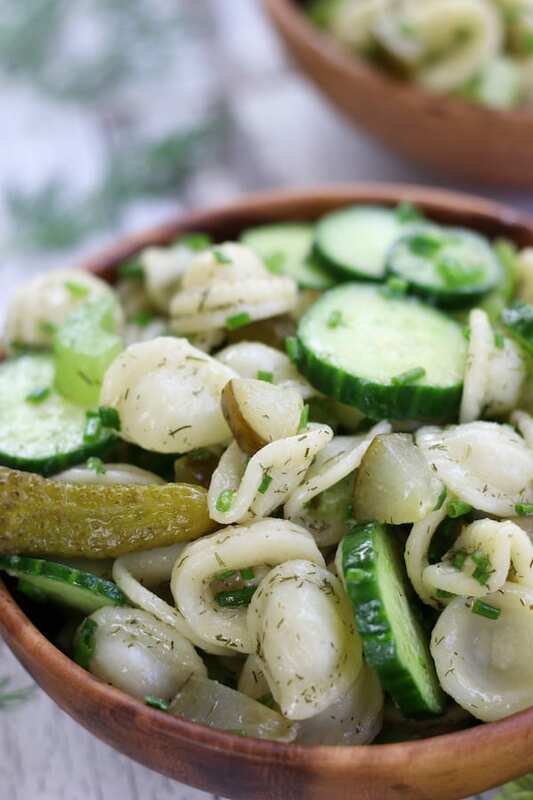 If evenly divided into 12 portions, there are 228 calories per serving of this Dill Pickle Salad. I have a love affair with English cucumbers and it is extremely rare that I buy any other version of this tasty veggie these days. Here are some of the most common questions about English cucumbers. Do I need to peel an English cucumber? I purposefully purchase organic English cucumbers so that I am highly comfortable feeding my family cucumber slices with the skin on. Either way, they taste great with the skin on or off. I believe yes, they do taste a bit different from standard cucumbers in that they are sweeter. They also have less water and seeds to they tend to be very crisp. Perfect addition for a pasta like this one. Are English cucumbers the same as hothouse cucumbers? Yes, they are the same cucumber. You also will find that English cucumbers (aka hot house) are much longer than traditional cucumbers and will be wrapped in plastic in the produce department of your local grocery store. If your pasta salad won’t be sitting in the hot sun and you would like to jazz it up even more, here are some fun possible additions. Honestly, I could eat a plate of this by itself and be happy as a clam. 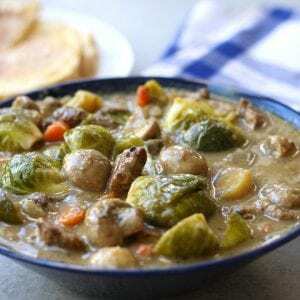 However, it also tastes amazing as a companion with these meat recipes. Is this a kid friendly pasta salad? I absolutely think so. Our resident little one DEVOURED this pasta salad and asked for more. What is the best Organic Pasta? I am absolutely in love with Garofalo variety pack carried at Costco. The challenge however, orecchiette does not come in that variety pack. This is my next favorite organic brand that carries orecchiette. How long does this pasta salad last? If kept in the refrigerator, this pasta still tastes amazing 3 to possibly 4 days later. Bright, fresh and crisp! 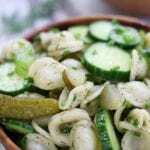 Dill Pickle Pasta Salad has no mayo and works perfectly for summer potlucks and BBQ's. Bring a large pot of water to a boil. Once boiling, heavily salt (1/4-1/2 cup) and cook pasta to al dente following instructions on package. Meanwhile whisk together ingredients for vinaigrette in a large bowl. Once pasta is done cooking drain and add to vinaigrette. Toss well and let pasta cool to room temperature. 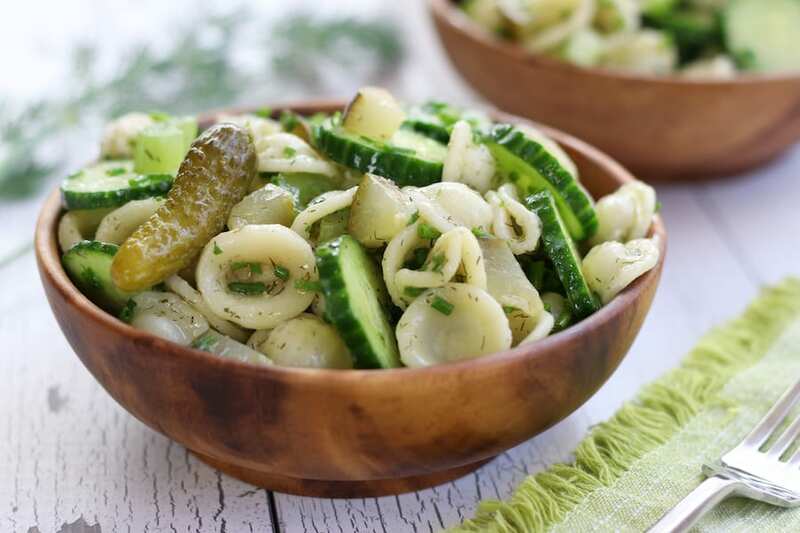 While pasta is cooling prepare pickles, chives, celery and cucumber. Add to pasta bowl once pasta is cooled. Toss well and serve chilled.